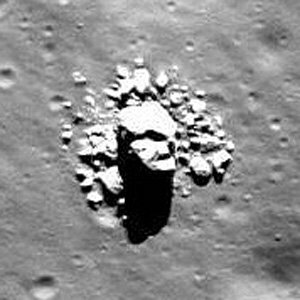 The Lunar Reconnaissance Orbiter Camera (LROC) acquired an image of the interior of Schiller crater on the Moon and this grumpy-looking boulder was found within by a Moon Zoo member. Just what is it, and what could have created it? Next Post How Many Stars Can Astronauts See? Cool Mad Moon Rock. Are these sattelites capable of seeing man made objects like the vehicles the Apollo Missions supposedly left there? Yes, they’ve imaged most if not all of the Apollo landing sites. You can see left materials, landers, rovers, footprint trails. Thanks J. is there a web site I can access to view that type of thing? Sure, you can start here for one: http://lroc.sese.asu.edu/news/index.php?/archives/454-Skimming-the-Moon.html#extended and then do a search there for “Apollo”. There’s a bunch. Does anyone else see the clownish face to the side of the creepy face? It is made up of several smaller stones and, perhaps, shadows. It’s not really a “rock,” more like a tower, crumbling from mass wasting. The top of that formation is easily 50 meters across. How can anyone not be aware that LRO/s LROC cameras have imaged all six of the Apollo expeditions? The vehicle has been in lunar orbit nearly three years now, and that’s no small thing. No man made object has managed to stay in lunar orbit that long before. Still, the formation rolled to where it’s currently positioned, so in that sense it’s more like a rock — a big one — than a tower. Whatever it is, it’s damn interesting….from surprised suns to mad moon rocks, very cool!